Bonds seem to like the weak economic data we’ve been getting lately. Over the past couple days we’ve picked up almost .125% (one-eighth) in rate pricing. If you don’t know what that means, you haven’t been paying attention. Blogging has gotten more and more complicated with the expansion of the business. We have currently got 34 clients/loans we’re working with, and that takes up a huge amount of time. Rest assured, we’re still here. Thought I’d post this by way of letting you know how things are. Charlotte, our little 4-year-old, has been helping me with the garden, as you can see. She’s wearing a brand-new handmade dress, made by our wonderful neighbor Aunt Lily. 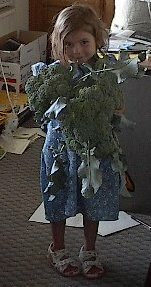 She (Charlotte) broke her arm yesterday, but we had time to get this harvested before that happened (yes, yes, she’s fine. It’s just a broken arm. Happens here all the time). So yeah, things are good here, and thanks for asking. Hope things are good where you are. Okay, so it’s been a while. I apologize. It isn’t as if I’ve been sitting around bored and putting this off, but I know that the attention span of blog readers is not all that great, and I also know that there’s no reason to keep reading the blog if there’s nothing new here to read on a regular basis. Again, my apologies. It’s on my list of things to do every day, but some days that list just gets longer and longer. The Fed raised rates again, for what is now the 17th consecutive meeting, a record. Prime is now 8.25%, and the Fed Funds rate is 5.25%, which is higher than the yield on the 10-year bond. This is called a yield curve inversion, and it has presaged a recession every time it has occurred. I’m not predicting. I’m just informing. What that means is that the 30-year rate is staying pretty much where it’s been for the last 3 months, hovering between 6.625% and 6.75%. Short-term rates, though, for instance adjustable mortgages, have not fared quite so well. To say the least. The 3-year ARM right now prices out at 6.375%, less than half a point below the 30-year. Still, that’s better than it was a few months ago. Rate squashing means that the 5-year and 7-year ARMs are also 6.375%, though, so nobody is really selling the 3-year much at the moment. At least they better not be. The World Cup has been absolutely fascinating. I’m a huge Zinedine Zidane fan, and I was deeply saddened that he looked so old and useless the first few matches. That was more than made up for by his brilliant performance against Brazil. And look, the US has its problems, but we tied Italy and did it playing a man down for 45 minutes. With a coach that actually wanted to win matches, we might have come out on top in that match. And Italy is in the semifinal. There’s great reason to believe that the US is just one or two players away from being a major international contender. One year later, the Berlin Wall fell. You never know what can happen.